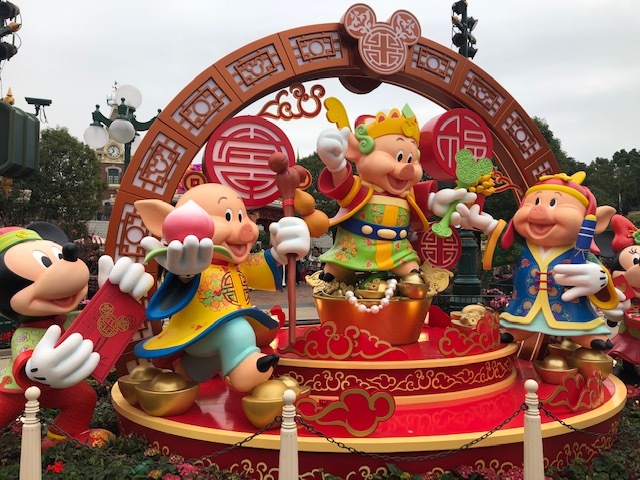 Hong Kong Disneyland cleverly is celebrating the upcoming Year of the Pig by incorporating the Three Little Pigs into their New Years decoration. 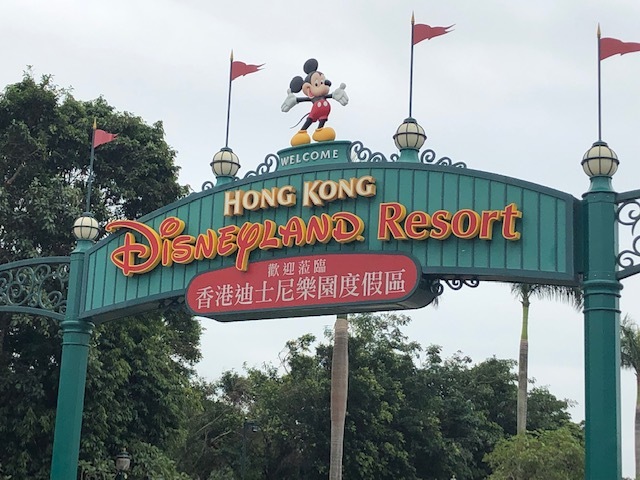 When Brett and I learned several months ago that the price of admission to Hong Kong Disneyland for over 65 seniors was just $13US, we knew we had to go check it out. Opened in 2005, Hong Kong Disneyland is located out on Lantau Island and is the largest amusement park in Hong Kong. To avoid cultural issues, the park was designed using Chinese customs and traditions, including feng shui. We were a bit surprised how much smaller the park was than the Disney parks in the U.S. It took Brett and I only three and half hours to visit the whole place, including a lunch break and time for five rides. However, we picked a wonderful day to go – the MTR wasn’t crowded nor was the park, and lines for the rides moved quite quickly. The weather was delightfully cool as well. On the surface everything looked very similar to the Disney parks in the U.S. – you enter through Mainstreet, USA, for example – but there were also subtle and not-so-subtle differences everywhere. 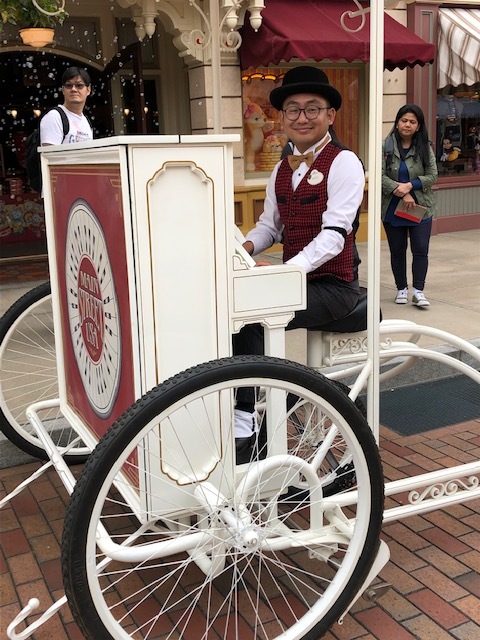 For example, Chinese traditional music was playing as we entered the park and walked down Mainstreet; ride instructions were given in both English and Chinese; and the food offerings throughout the park were mainly Asian other than snacks. 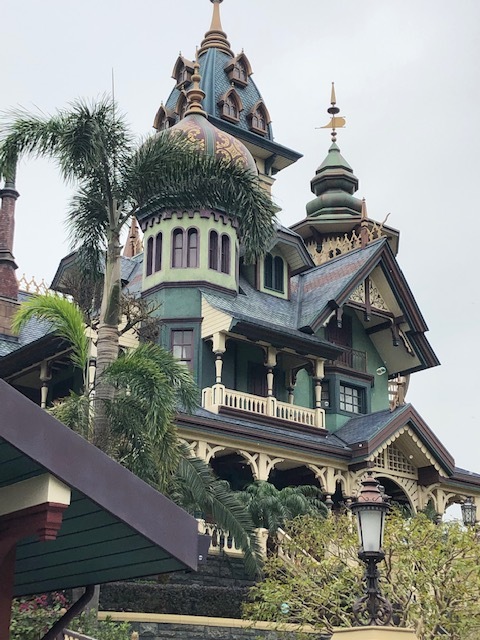 However, in signature Disney fashion, the entire park was themed beautifully, was spotlessly clean and the park employees were friendly and polite. Stores and kiosks selling Disney merchandise were everywhere. Honky tonk music on Mainstreet USA at the same time traditional Chinese music played in the background was the perfect example of HK Disneyland’s mash-up of Chinese and American cultures. 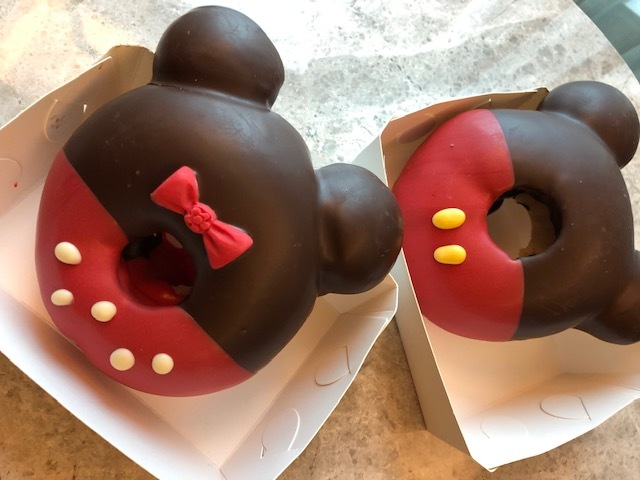 We bought Mickey and Minnie Mouse doughnuts for our breakfast the next day. As for the rides, we found the two roller coasters we rode much faster and more thrilling than in the U.S. The Runaway Mining Cars turned out to be a combination of Big Thunder Mountain, Rock’n Roller Coaster and the Expedition Everest Ride, and was very surprising and fun. Space Mountain was a whole heck of a lot faster and crazier than it is in the U.S. and we noticed several children left the ride sobbing (we screamed the whole way and loved every second of it). The ride that was the most different though was Mystic Manor, the Chinese version of the Haunted Mansion. In Chinese culture, ghosts are not culturally appropriate as a ride theme, so Mystic Mansion focused on magic instead. The ride was well done though and the special effects were top notch. Overall we had a wonderful time at the park and were glad we made the trip, although after all of the walking we had done the day before we came back to the hotel feeling quite exhausted. 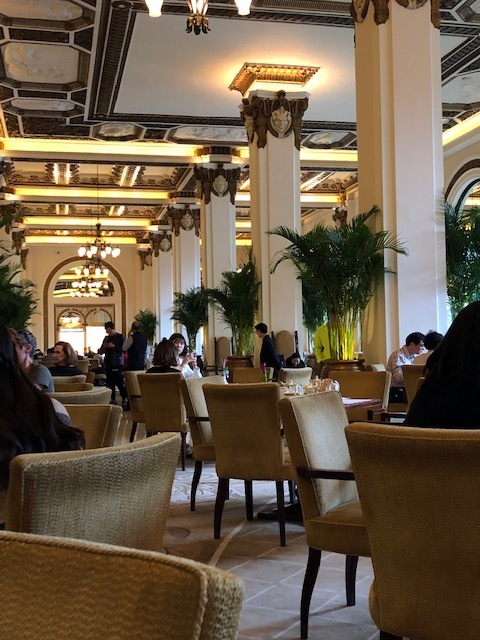 The lobby of the Peninsula Hotel, a landmark in Hong Kong since 1928. 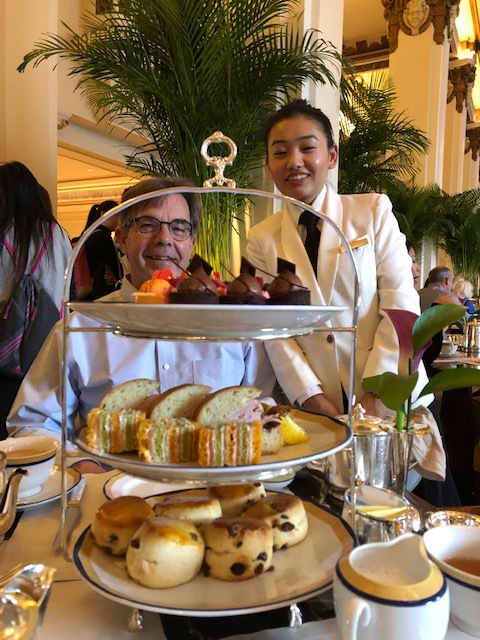 Yesterday was a 180° change from the trip to Disneyland – we went to afternoon tea in the lobby of the Peninsula Hotel, an experience long on my bucket list. We had been absolutely thrilled to find out when we were in Portland in December that our friend Sylvia (who was born and raised in Hong Kong) would be here at the same time as us, so she messaged us day before yesterday and we decided to get together for the tea. Afternoon tea for three is delivered! We also each had a personal silver teapot filled with Darjeeling tea (several other varieties were also available). Fresh warm raisin scones with clotted cream and jam along with smoked salmon and cucumber sandwiches. 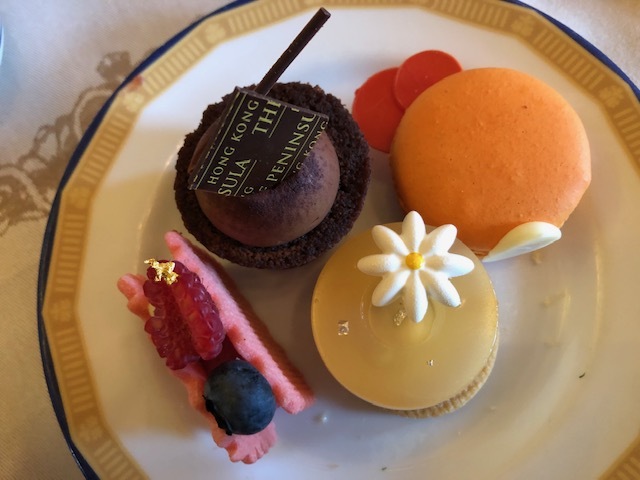 The dessert selection – every bite was delicious! The tea and service were everything I had dreamed of and more. The elegant setting was just the start, but a string group provided live music while we dined and the food and presentation were exquisite. 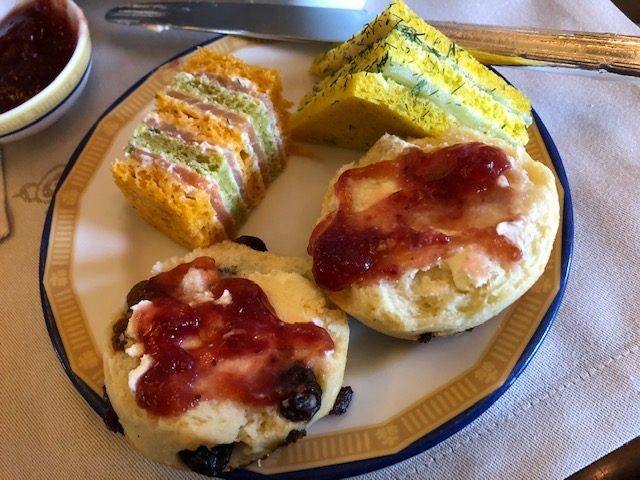 Our tea for three included fresh-baked raisin scones served with clotted cream and jam, assorted tea sandwiches, a selection of dainty desserts, and Darjeeling tea served in individual silver teapots. It was divine, the memory of a lifetime, and I got to experience it with Brett and one of my best friends. 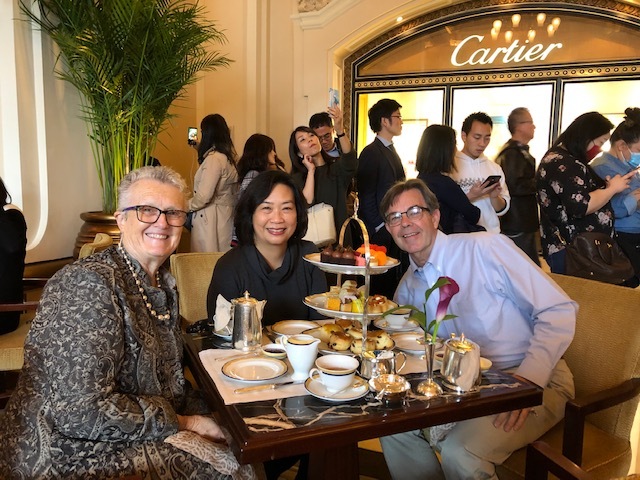 We enjoyed tea with Sylvia, a long-time friend from Portland. She’s in Hong Kong to celebrate the New Year with her family. One of the many elaborate New Year’s decorations up in Tsim Sha Tsui. After tea, Sylvia invited us to walk for a bit around Tsim Sha Tsui. We were on the hunt for a new carry-on bag as we need one for our train journey in Australia and she helped us find a shop with high-quality bags at a good price. We then stopped at Marks & Spencer, one of favorite shopping spots in the past, and picked up some cookies and a box of my favorite muesli to carry along to Australia. We checked out Chinese New Year decorations in the area and a New Year’s shop that had us walking around with our mouths hanging open – the selection was incredible! I had mentioned that I was sort of looking for some wool shawls, and Sylvia found a shop where I bought two (cashmere!) for just $20US. She said this was a good time to buy them because stores are clearing out winter items for the New Year and offering great prices. At the end of the afternoon we stopped in an upstairs Chinese cafe on bustling Nathan Road for some refreshments and to watch the crowds below before saying our good-byes for the day. We were back in our hotel room in time to watch the beautiful Saturday night light show across the harbor! 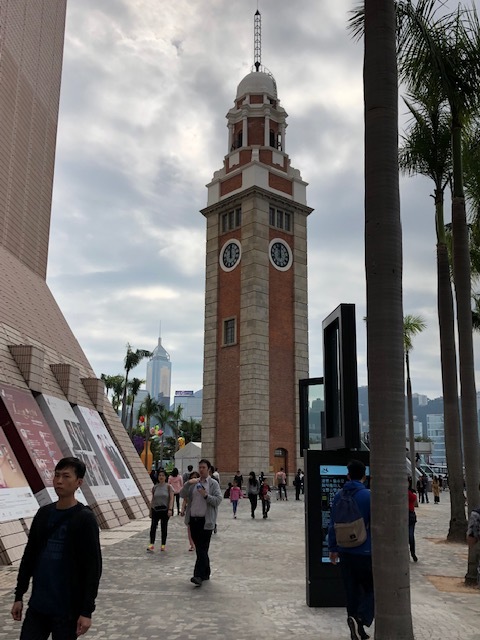 The Hong Kong Clock Tower, built in 1915. It is the only remaining part of the old railway station that connected Kowloon with Canton (Guangzhou). 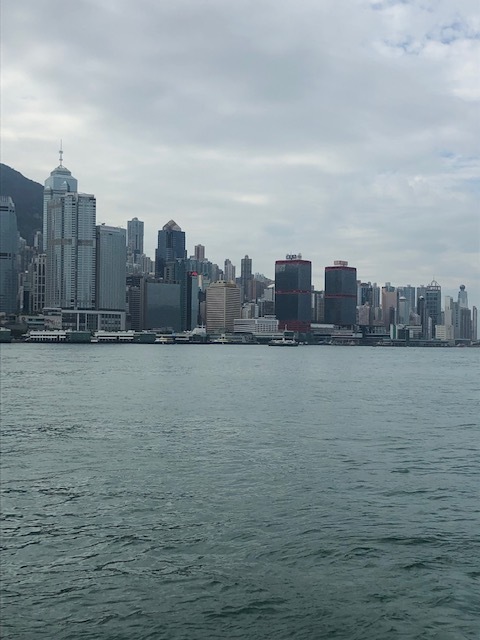 Looking out at Hong Kong Island from the upper deck of the Star Ferry. As seniors we rode the ferry for free. 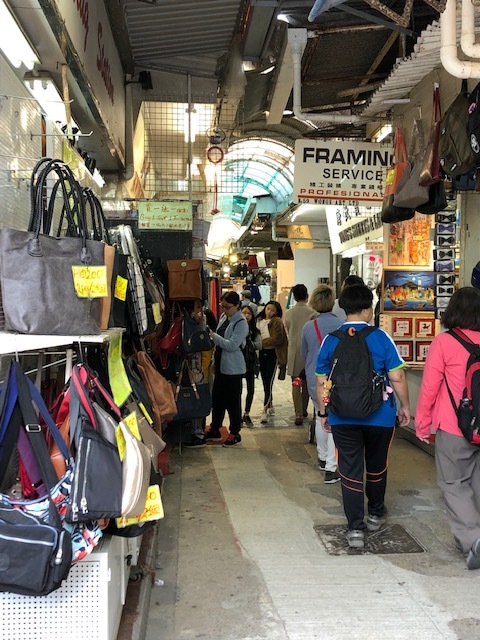 Earlier today we went Stanley Market, located on the far side of Hong Kong Island, and our favorite shopping location back in the day. Its narrow lanes were always filled with amazing bargains and we used to depart carrying several bags filled with treasures purchased at a fraction of the cost at home. Heading into the lanes at Stanley Market. There weren’t as many shops as before, and most prices were very high. Our favorite Stanley restaurant was still operating, although the building was now bright yellow instead of turquoise. The menu had also changed, but . . .
. . . the food was good and the views still lovely. We debated riding the bus over from Central, but it was warm and humid this morning and in the end we decided we’d rather sit in the back of an air-conditioned taxi. The ride over was lovely, with beautiful views of Deep Water Bay and Repulse Bay as we passed through on the way to Stanley. There were many, many more high-rise and luxury apartment than in the past though. We went with no plans to actually buy anything in the market, but the prices there now would have made it unlikely anyway. We saw a few things that we liked but that these days could be purchased for far less back in the U.S.! After wandering around for a while we felt a bit sad over the changes, but then happily discovered that our favorite Stanley restaurant, now called The Boathouse, was still operating. 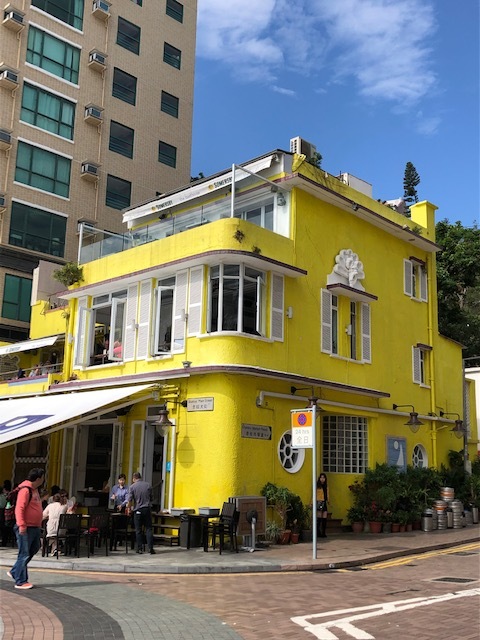 We enjoyed a nice lunch there along with lovely views of Stanley Harbor then walked back up the hill to the taxi stand and caught a ride home. Back in Tsim Sha Tsui we turned in our Octopus cards. Our refund covered over half of the cost of our taxi rides. 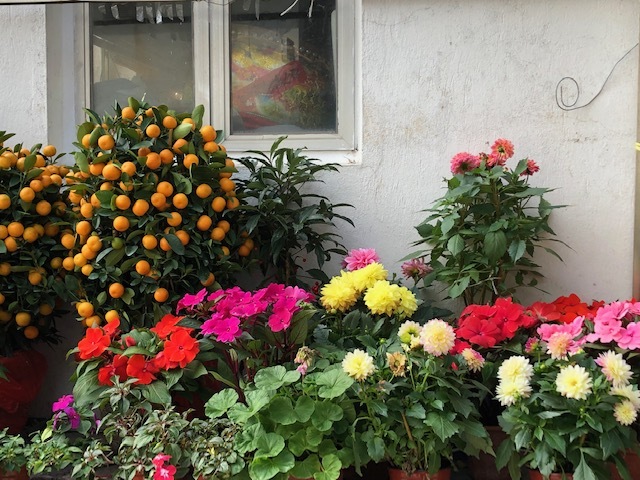 Colorful flowers and tangerine trees ready for the New Year outside of the Stanley Fisherman’s Recreation Association building. Back when we were making up our itinerary for the Big Adventure, we were unsure about whether to visit Bangkok, a new location for us, or come back to Hong Kong once again. 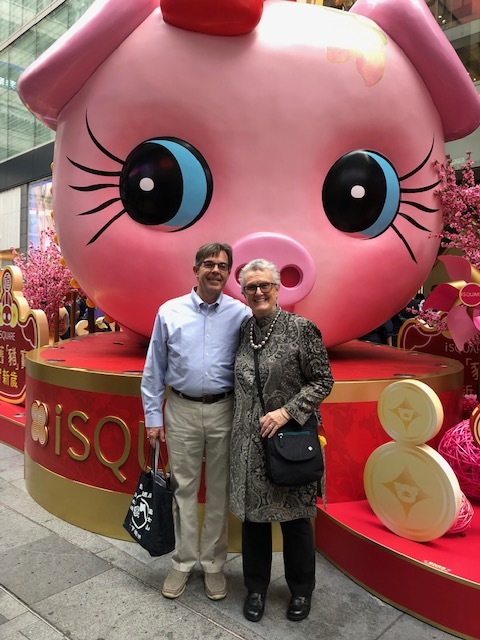 Both Brett and I are very happy now that we chose Hong Kong – we’ve had a wonderful time, and the visit has allowed us to enjoy old memories and make new ones. Tonight we’re meeting Sylvia for a New Year’s dinner celebration (there will be roast duck!). Afterwards we’ll finish packing our suitcases, and tomorrow afternoon we’ll depart Hong Kong for down under in Perth, Australia! Zai jian, Hong Kong – its been fun! Your jacket that you bought in India is absolutely awesome! Have a safe trip to the southern hemisphere. It was almost too hot here yesterday to wear it. But, I loved being able to wear it to the tea. Once again we are sad to leave – we love Hong Kong! – but excited about heading to our next destination! I agree, your jacket is marvelous and was perfect for tea. What a find! I’d love to see the shawls you purchased too. It was fun to have a chance to wear the wear the jacket even though it did get a bit warm. I absolutely love it though and can’t wait for the next opportunity. I added a picture of the scarves I got at the bottom of the post. It was gratifying to find that there are still a couple of bargains around in Hong Kong. Your shawls are beautiful along with your coat! You are finding some lovely useful items! The tea service looks perfect! So glad you were able to experience with your friend Sylvia! 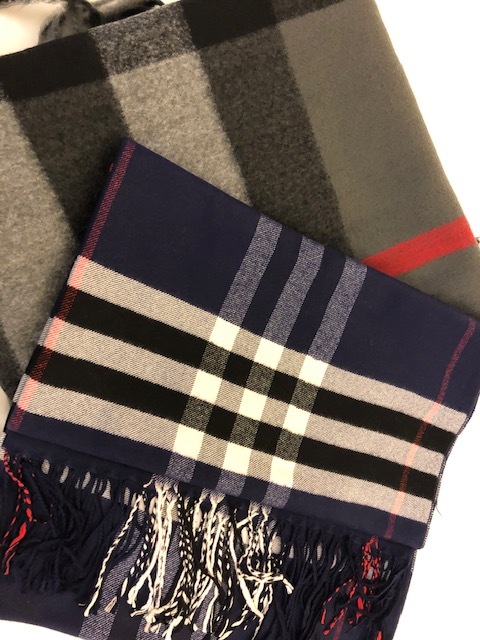 I was thrilled to find the shawls – I had hoped to get them in India but never saw anything I liked there (except for the pashmina Brett got for me). These were a real find, thanks to Sylvia and her knowledge. I’ve known Sylvia for 16+ years. She comes home to Hong Kong every year, and I always told myself that I would love to visit here when she was here. And it happened! Getting together with her here was the best part of our Hong Kong visit! We have had such a great time here – as we were walking home last night we both agreed that we didn’t give ourselves enough time here, that we felt like we were just settling in. But, we’ve been right at the edge of our budget – I’m not sure it could have handled a longer stay. I’m very happy with my purchases but the suitcases now feel very, very full. We’ll get some use of the new stuff once we’re in Japan where it will still be winter. I had to really look at the Central picture. WOW! Has that skyline changed! Your jacket is smashing, matching the beauty of the Peninsula. What a great time, sharing tea with friends. Thank you for sharing your impressions of Stanley. I have heard much the same, but it is interesting to see my old framing shop and the restaurant we used to go to after the kids’ soccer games. 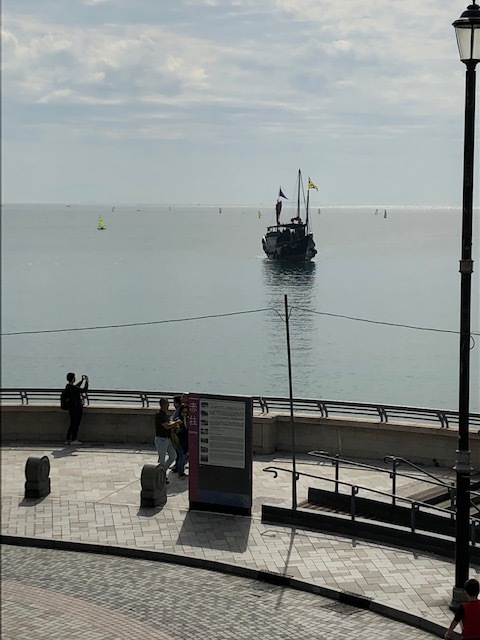 Does the condo with a hole in the middle for the dragon still have a straight path to the sea? Off to Australia. Sub continent, Asia, and now down under. Glad the bucket list includes so many places I would have loved to go. The pictures get me there without the plane flight! Journey well. I am sure you will be ready for the rest and fun with grands in one more short month! The skyline is very different – we keep finding buildings that used to be among the tallest and they’re “babies” now, like the Hang Seng bank building, etc. Stanley is but a ghost of its former self. I’m glad we got to experience it and its bargains back in the day. But, we were happy to find the restaurant still open and the food still good. And yes! The building with a hole is still there – I searched for it on the way over and was thrilled to see it – I knew we were almost at our destination. I had been afraid it would be replaced with something newer but it still looks good. We’re ready for travel today and hoping for an easy trip. At least we’re not changing time zones this time! Glad you enjoyed the tea. I was there 20 years ago and still have memories – thanks for the photos. I do have to tell a humorous story about “afternoon tea”. We were in Ireland this past summer and the tour included an “afternoon tea” at a castle/hotel at about 2;30 pm. We did not have a planned lunch that day (because of this) but many people ate something anyway as it turned out. It seems that most of the group, which was mostly 60+ from the Midwest, did not understand that “afternoon tea was typically at 4 pm and would have significant food choices provided. They figured it was just “tea and a biscuit”. So all this great food showed up and nobody was hungry. I ended up with a great lunch. Glad you are enjoying Hong Kong. We left the Peninsula feeling VERY full after the tea, and skipped dinner – I’m glad we didn’t eat before we went! It really was a very special experience though, especially being able to experience it with my friend. Hong Kong will always be one of my favorite cities. Don’t know though if we’ll ever make it back, but never say never is my motto! I’ve never been to Hong Kong but after reading your posts, I will add it to my list of places to visit! It’s so cool you were able to meet up with Sylvia. The Disney park looks like fun. I’m looking forward to your posts about Australia. Safe travels! Hong Kong is a very fun and easy city to visit, and easy to get around as well – that part hasn’t changed. I can’t believe how much we walked here though – I did three days of nearly 15,000 steps! Leaving Hong Kong is bittersweet: we love it here but are excited about getting to Australia and taking our train trip. It’s going to be quite a change for us weather-wise though – they’ve been having some very hot weather. I’m also looking forward to seeing my brother when we get to Sydney! Love your shawls & jacket & loved reading about HK Disney! I’d absolutely love to get together in Tokyo, if it all works out time wise. I usually go 2x/year, but a third trip would be welcome, I’m sure, if I could work it out. Thanks! Shopping is over now though for me – my (and Brett’s) suitcases are full! I’m looking forward to getting to use the shawls for a while when we’re in Tokyo. Let me know if you end up coming to Japan – we’ll work something out. We’re staying in the Setagaya area this time versus nearer to Roppongi, but it still will be easy to do a meet-up if your schedule allows. It would be great fun to meet you there! Here in Florida I can get a 3 day Florida residence pass at Disney World for $175. I think a non resident pays $109 for one day and parking costs $25 now. You got a real deal. Love all the pictures and that tea service looks amazing. It really helps when you have a native to guide you to the right places. It was interesting reading about the now and then differences. Can’t wait for Australia.